Meet other alumni, recent graduates, and University students interning in the Washington D.C. area at our fall networking reception! 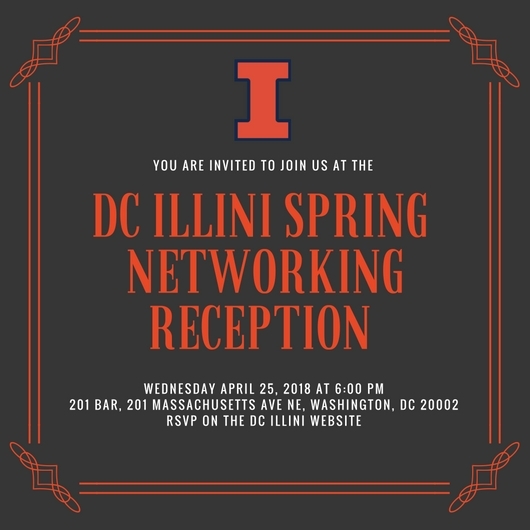 The D.C. Illini will be hosting a networking reception at 201 Bar with light appetizers for alumni to meet with other alumni new to the area, recent graduates, and University of Illinois students interning in the Washington, D.C. area. During the reception, local alumni will have opportunities engage in small-group discussions with the recent graduates and interns concerning experiences living in the area, starting a career, D.C. Illini events throughout the year, and other topics. Whether you're a D.C. Illini member, interested in the Club, a recent grad, or intern, come on out! RSVP here. Who: U of I alumni and interns (UIUC, UIC, and UIS campuses) in the Washington, D.C. area. When: Wednesday, April 25, 2018 at 6:00 - 8:00 p.m.
Where: 201 Bar, 201 Massachusetts NE, Washington, D.C. 20002. 201 Bar is conveniently located just a short walking distance from the Union Station Metro station (Red Lines). There is also a street parking available. RSVP: RSVP at this link.